Back cover blurb: A woman and child are found locked in a basement room, barely alive. No one knows who they are - the woman can't speak, and there are no missing persons reports that match their profile. The elderly man who owns the house claims he has never seen them before. The inhabitants of the quiet Oxford street are in shock. How could this happen right under their noses? But DI Adam Fawley knows that nothing is impossible. And that no one is as innocent as they seem . . .
Wow. Another stunning novel from Cara Hunter. DI Adam Fawley once again has his work cut out. This time investigating a complex abduction case after a woman and a young child are found locked in the cellar of a large and expensive property. Discovered by the wealthy neighbor who is renovating his own multi million pound property, the woman and child are both clearly traumatised by their ordeal. The police are at first, are baffled, as there’s no trace of the woman on any missing persons register. The only woman to go missing around the same time as her presumed capture is already dead, the victim of a brutal murder, her killer already doing time. But somehow, these two case seem to be linked. Just how is one of the many headaches that Fawley and his team must face in order to get to the truth. Having got used to Cara Hunter's writing style, I like that there are no defined chapters, and instead the narrative is interspersed with snippets of newspaper clipping, social media, police interviews etc. Admittedly it’s unusual, but it does genuinely work. 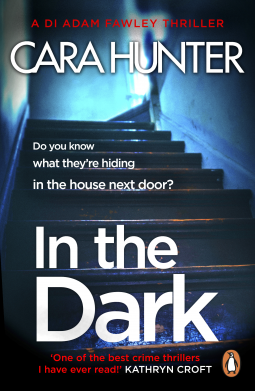 In the Dark is an intense thriller that will have you guessing again and again. It’s got a killer twist that I didn’t see coming in a million years and will definitely keep you on your toes! In the Dark is available from 12 July 2018.